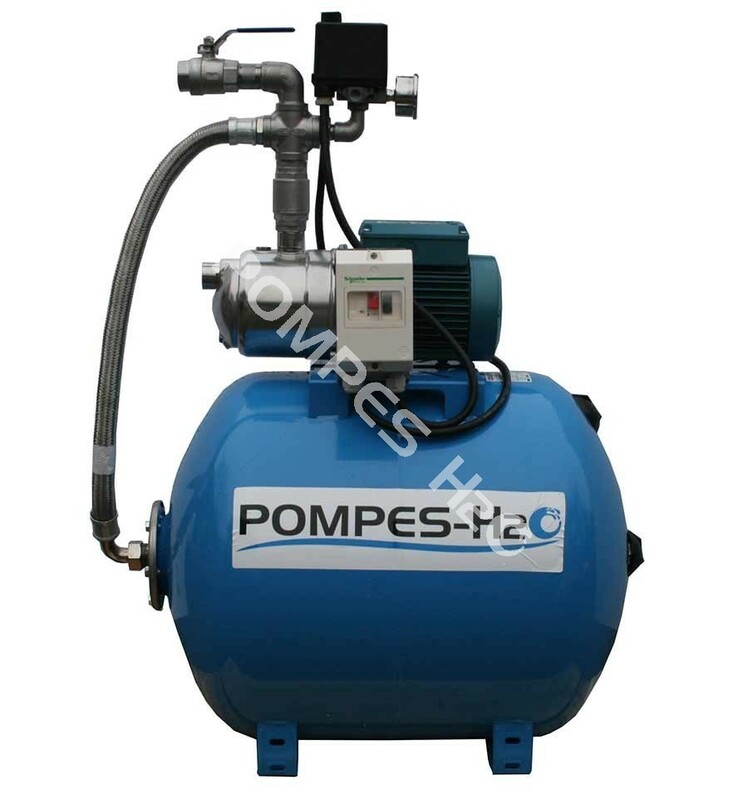 Booster pump 100L equiped with self-priming jet pump in stainless steel, power 0.75 ou 1.10 kw, single-phase or three-phase, maxi. flow rate to 5m3/h, maxi. pressure 6.1 bar. Maxi. suction heighter until to 9m, tank with stainless steel flanges. Ideal for pumping in wells until 9m in suction. Used for boosting and water supply system at constant pressure, for water distribution system and for many kind of boosting, such as cold water supply for domestic use, for watering, irrigation, pumping in wells, for rainwater tank lifting, for suction of slightly loaded water with solids particulates, or clean water, for transfer of drinking water, for cold water system at constant pressure of sanitary block. - Lifting water from wells until to 9m below the level of the pump. - Pumping in water court, or in drinking water tank, or lifting rainwater from cuve. - Pumping of drinking water in interiors tanks, lifting untreated water from drill, from water replenishment. - Home booster for watering, irrigation, sanitary block of campsite, and for water supply at constant pressure in general. - Induction motor 2 poles, 50 Hz (n = 2900 t/min). - NGX : Three-phase 230/400 V ± 10%. - NGXM : single-phase 230 V ± 10%, with thermal protection. - Level of protection : IP 54 - Insulation classe F.
- Highly ifficient classe IE2 for three-phase motor from 0,75kw to 1.10kw. 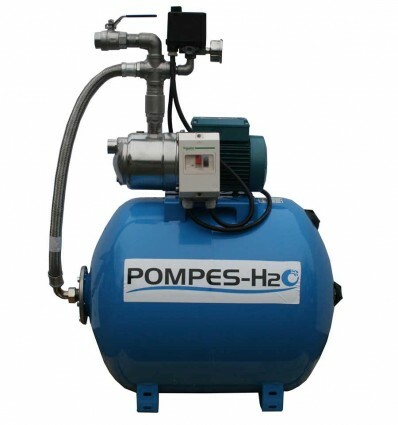 - Mono cellular self-priming jet pump with in-built ejector. - Pump housing and cover in stainless steel AISI 304. - Shaft in stainless steel AISI 430. - Diffuser and ejector in NORYL PRO-GF20. - Mechanical seal in hard carbon - ceramic - NBR. - Interchangeable bladder tank - food quality. - Made in paint stainless steel epoxy. - Lower flange, superior flange and screws in stainless steel. - Bladder in EPDM butyl, for drinking water. - Threaded male outlet in stainless steel. - 1 bladder tank with stainless steel flanges 100L, food quality, PS 10 bars. - 1 electrical self-priming pump in stainless steel JET 0.75 ou 1.10 kW - CALPEDA NGX (detail in table above). - 1 pressure switch three-poles XMP Telemecanique - 0-6 bar or 0-12 bar. - 1 manometer axial 0-10 bar. - 1 coupling 5 ways 1" in brass. - 1 flexible of connection in stainless steel M/F 1" long 700mm. - 1 ball valves M/F 1". - 1 many coupling in brass. - 1 motor circuit-breaker Telemecanique GV2 ME (detail in table above). - 1 waterproof box IP 56, with inlet-outlet on the gland, removable front with an accessible reset. - 1 support in stainless steel for circuit-breaker box. - Screw in stainless steel. - HO7RN-F cable (3G1.5 mm² or 4G1.5mm²). - Normalized plug 2P+T for single-phase model or free cable for three-phase model. - Delevery from 4 to 8 days, mounted and wired up. - Standard norme EN 60034-1; EN 60034-30. EN 60335-1, EN 60335-2-41. 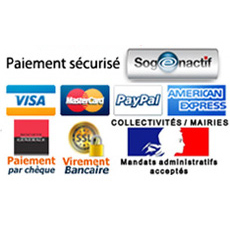 Règlement par Carte par connection sécurisée 128 Bits SSL sur le serveur de votre Banque. 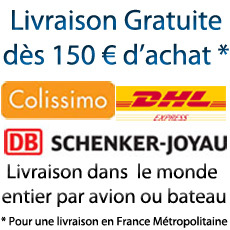 Aucun numéro de carte ne circule sur notre site.